Netanyahu rival Gantz, urges unity in speech to pro-Israel lobby in U.S.
Israeli Prime Minister Benjamin Netanyahu’s strongest election challenger, Benny Gantz, called on Monday for unity and moderation in a speech to a major pro-Israel U.S. lobby group that has been uneasy at Netanyahu’s courting of far-rightists. 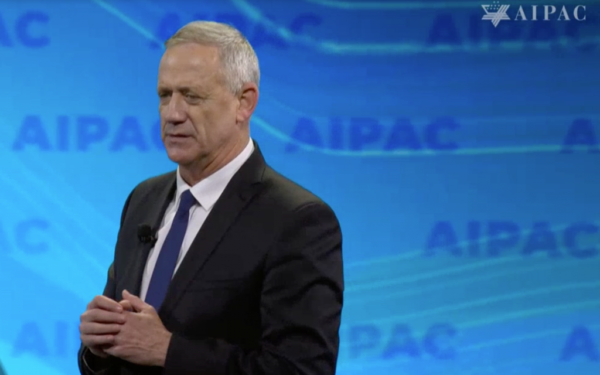 Gantz’s appearance at AIPAC was overshadowed by a rocket strike on Israel from Gaza that prompted Netanyahu to cancel his own speech at the event so he could return and oversee retaliation. Gantz, a retired army general who is a centrist newcomer to politics, went briefly off-script to commend Netanyahu’s decision, before delivering veiled censure of the conservative premier’s electioneering, which has included dismissive rhetoric about Israel’s Arab minority and appeals to ultranationalists. “The divisive dialogue tearing our strong nation apart may serve – I doubt it, but it may serve – political purposes, but is shredding the fabric that holds us together,” he said. Netanyahu forged a pre-election alliance last month with Jewish Power, an ultranationalist party that includes adherents of the late anti-Arab rabbi, Meir Kahane. The four-term premier also faces criminal charges in three corruption cases, pending a review hearing after the election. Netanyahu has denied wrongdoing and described himself as the victim of liberal media bias and judicial overreach. U.S. Jews, a largely Democratic constituency, have at times fretted over Netanyahu’s alignment with President Donald Trump’s Republican administration, and Gantz talked up AIPAC’s bipartisan strategy. After the speech, Gantz met Vice President Mike Pence, who also addressed the gathering. Netanyahu, who opinion polls show running neck and neck with Gantz, has dismissed his rival as a “weak leftist,” accusing him of allowing Iran to hack his cellphone. Gantz outlined national security policies that were not significantly different from the prime minister’s, and laughed off the alleged breach. Iran has denied targeting Gantz. Gantz has said he had been informed by Israel’s domestic security service of a breach but there was no sensitive information on the device.